By looking at Figure 4.7, one can see that water is everywhere around us. This reality means that nearly everything we do as humans has the potential to affect our water quality. The Water Cycle (or Hydrologic Cycle) is the process by and through which water in all of its phases occurs within our environment. It runs off as surface water where it ends up in our streams, rivers, ponds and lakes, and eventually, our oceans. During the latter two, our water’s quality is influenced by the conditions of the environment and the ways it is used, both naturally and by humans. All of the water in the world is contained within the water cycle; however, it is important to delineate the water cycle into local units known as watersheds. A watershed is a network of streams and/or rivers that are connected and that drain an area of land. While watersheds are delineated based on the surface topography, the water within it still includes all phases of the water cycle. Different watersheds, whether they are connected or not, have distinct physical, chemical and biological qualities and quantities that make them unique. We all live in a watershed. The more we know about our individual watershed, the better we are able to develop a plan to monitor its water quality; predict and explain changes in it; and care for and improve its overall health. 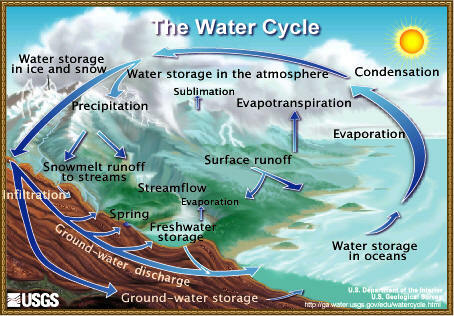 For more detailed information on the water cycle, refer to the USGS Water Cycle Summary page, which offers a thorough account of the complete water cycle. For a more abbreviated summary, refer to the USGS Water Cycle Quick Summary page.